A horde of barbarians is amassing at your gate. Are you ready to let them come and rend you to pieces with their swords and fangs? Of course you aren’t. That is why you must fight! With a few mere strokes of your finger, you can mine the earth for resources, build thick walls for your castle, and move your troops into formation. The battles ahead will be difficult; you will have to adapt your strategy against assorted computer opponents that grow increasingly more cunning, as well as human players that can match you in a battle of wits. However, if your mind is sharp, then you can ensure that your army is the most dominant force of all in Castle Clash! You won’t be able to clash with enemy castles if you don’t have one yourself. 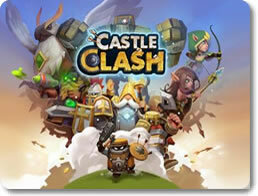 Castle Clash feature in-depth castle creation tools that will allow you to easily design the castle of your dreams. You’ll employ strategy long before the enemy starts attacking, as you must assemble a castle that is as defensible as it is grand. Determine the layout of your headquarters. Establish the position of your walls, buildings and defensive structures in a way that will impede invaders most efficiently. Build Gold Mines and Mana Generators to acquire vital resources. Set up vaults to store those resources for later use. Set up Army Camps to recruit troops. Make Training Yards so that you can upgrade them. Fortify your castle with any number of defensive structures like Watchtowers, Cannon Towers, Garrisons, bomb traps and more. Buy Shields to ensure fool-proof protection for a set period of time. Making a castle is only half the fun. Ensuring you have a well-trained army is the other. There is no shortage of valiant soldiers waiting to fill your ranks and defend your land. If they are not enough for you, then consider recruiting a powerful Hero to bolster your forces with unique abilities. Train a healthy variety of adorable-looking units, including axe-wielding ogres, centaur archers, fairy dragons, walking mechs and more. Spend additional mana to improve your troops’ statistics. Acquire powerful Hero units that look unique and come equipped with distinct abilities found nowhere else. Heroes may include the Succubus, Serpent Queen, Paladin, Thundergod, Assassin and so on. Sacrifice Slime units to enhance your Heroes. Erecting a fortress and training your troops will not be enough. You will also need to rely on sorcery. A well-timed spell could often mean the difference between victory and defeat. Deploy a healing circle on the battlefield with Restoration. Cast Ares’ Frenzy on your troops to send them into a berserker rage. Revive your fallen soldiers with Phoenix Flight. Call forth a Meteor to pummel a location from afar with a shower of fire from the heavens. 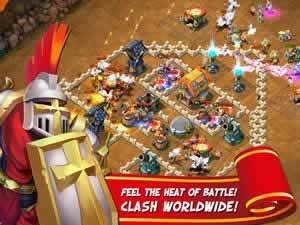 Castle Clash offers a deep and frenetic real-time strategy experience for the mobile device of your choice. It’s easy to get into with its intuitive touch-screen controls, but will take time to master with its creative variety of castle-building tools, units to command, and spells to unleash. The added benefit of player versus player action means this is a game that can last you forever. 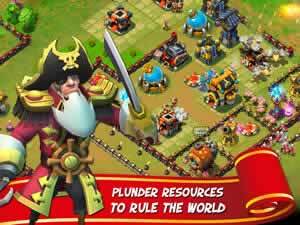 Get Castle Clash and wage fantasy warfare anytime and anywhere!